According to the website, Mental Floss, "the first documented use of the phrase in the sense of 'revealing a secret' comes from a book review in a 1760 issue of The London Magazine, wherein the reviewer laments that, 'We could have wished that the author had not let the cat out of the bag.' That, unfortunately, is about all we know for sure." "The first origin story claims the phrase refers to the cat o’ nine tails, infamously used by the Royal Navy as an instrument of punishment aboard its ships. The whip’s nine knotted cords could scratch an undisciplined sailor’s back pretty badly, hence its feline nickname. The bag comes into play because the “cat,” being made of leather, had to be kept in a sack to protect it from drying out in the salty sea air and keep it flexible. Removing a whip from a sack doesn’t immediately seem to have anything to do with revealing a secret (that the lash was on board the ship and would be readily used shouldn’t have been a secret to any sailor), but if you think of “letting the cat out of the bag” as a revelation that results in a punishment, it makes a little more sense." "[Perhaps] "letting the cat out of the bag" was always meant as no more than an entertaining mental image of the explosiveness of a confidence's revelation — usually what is deliberately concealed is of a salacious or titillating nature, thus there are often huge elements of shock and surprise when the truth comes out, somewhat akin to the commotion raised by a frightened cat suddenly loosed from the bag that had imprisoned it. Or it could have to do with a similarity between the behavior of both secrets and cats — once either is let out, they go wherever they want. (In other words, private news that has been made public spreads far and wide, despite all efforts to keep it contained.)" We're taking bets - where do you think the phrase originated? How interesting. I'm not sure! I think I like the whip idea best though for some reason lol. I always think the origins of certain sayings are always interesting. In this case, I would go with the "whip theory". It seems the letting out of a secret could lead to painful consequences... much like a whip against a poor sailor's back! FaRADaY: plus there's the cool benefit of a whip looking like a..a... WAND TOY! 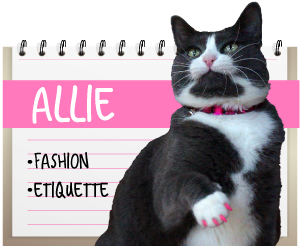 We aren't sure but we just know Allie looks SO ADORABLE in her bag! Allie: *giggle! * Why THANK you! What we notice in the midst of al this is that Allie has an inverted heart on her chin!!! Oh my cat! Do you know, we never noticed that before?? Cool! I think it originated with a cat and a bag! I mean, duh. 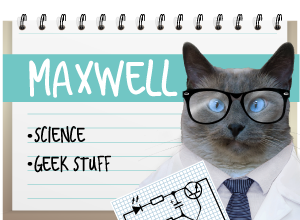 Maxwell: Leave it to Sparkle to set the humans straight! Score! haha! Sparkle's comment is hilarious. We however are siding with Snopes. We like the sound of salacious and titillating. And we like saying Snopes too. Our mom's kinda leaning the same way, to be honest! Heh heh heh... wise Sparkle is wise! 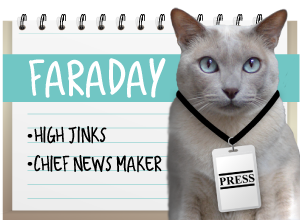 FaRADaY: *raises paw* Ya think it's a job that pays anything? I don't need those green papers, just nip. And noms. And WAND TOYS. Fascinating... we're going the historical route, as Mom was a History major! RILLY??? COOL! Our peeps love that stuff too. Momma & Papa are dying to finish the "Men Who Built America" series next Sunday night! Allie, I never knew you had a little black beard! Cute. Is Trader Joe using the winter bags already or does your peeps save them too. Re: bags? oh do they ever. *sigh* no, not out this year - at least not here yet! 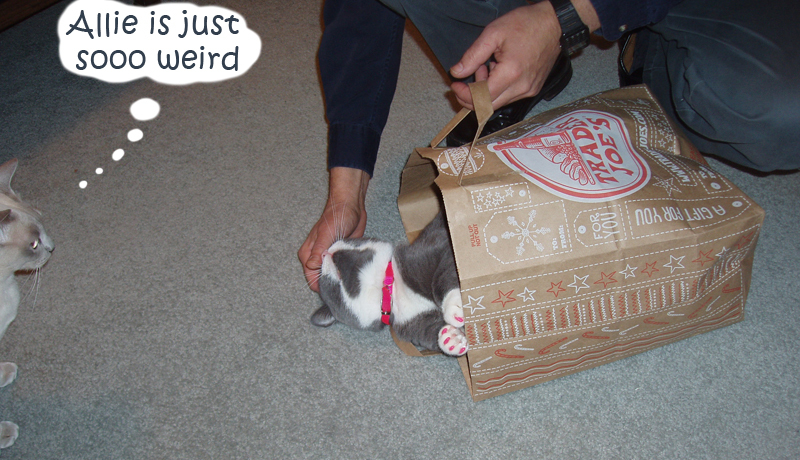 Allie...first, you look so cute in that bag! Second, historically speaking, that makes sense, just the mental image is less than appealing.. I wonder when bags were even invented? Interesting. You always come up with something educational, and we appreciate it.